Your account will be debited today, then every subsequent 4 weeks. Get in touch with us to arrange an alternative date. Your generous one-time gift helps fund our campaigns for a better and greener future. 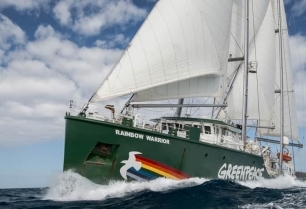 To stay independent, Greenpeace doesn't accept any money from corporations or the government. We rely entirely on people like you. That’s why your donation is so important, it literally powers every campaign we work on. Can expose and confront oil companies threatening the Great Australian Bight. Can help protect green and flatback turtles nesting at locations along the Great Barrier Reef. Can help fund research and investigations into illegal fishing practices. Together we can speak out for our planet. Greenpeace accepts zero corporate or government donations so we can remain fiercely independent. We are proud to be able to act without fear of our funding being cut. This means we rely 100% on individual supporters like you to fund our work. That’s why your donation is so important, it literally powers every campaign we work on. A regular gift will enable Greenpeace to investigate, campaign, document and lobby for a sustainable balance between humans and the environment. With your help we will expose environmental abuses by carrying out non-violent direct actions to raise awareness of our need for protect our oceans, forests, water supplies and our climate – the very life support systems of our planet. Regular updates on what's happening in our priority campaigns. Invitations to exclusive events and other exciting opportunities to take action. Peace of mind knowing you are part of the global Greenpeace community taking action to achieve positive environmental change. Pay by cheque or direct debit. The Greenpeace Trust is a gift fund listed on the register of Environmental Organisations under the Income Tax Assessment Act 1997 sub section 30.55 (1) item 6.1.1. Donations of $2 or more will be placed in the Greenpeace Australia Pacific trust fund and are tax deductible. ABN 61 002 643 852. You must be 18 or over to donate.